Through poor fortune or poor choice over the last six months there has been a lot of mediocre theatre served up by some of the establishment’s big names performing in London’s highest profile spaces. Having had the misfortune to sit through a disproportionate amount, there has been ample opportunity to muse upon the reasoning that leads to one wrong decision after another contriving to reduce potentially sublime theatre experiences into hollow shells of directorial pretension and actor artifice. The pendulum of audience response suspended over every production seems to swing heavily towards the director when it is not well received and towards the actor when all is going well. It is perhaps unsurprising that this should be the case. Given that much of London’s theatre is about reviving classics then the director is in a tight spot. There is an expectation that a play should be looked at afresh but too fresh – as Deborah Warner found with the School for Scandal and Charles Spencer’s enraged response to Ian Rickson’s Hamlet at The Young Vic demonstrate – and the critics can be up in arms. Actors’ are usually not blamed for such decisions and a safe, or even dull, production can generally reap much praise for the traditional performances of the cast –the phenomenally overrated Long Day’s Journey into the Night was stymied by overly naturalistic performances in an interminably conservative productions. The result: no risk and the cast showered in praise. The key in theatre, as with so much in life, is balance. A director must work harmoniously with the actor to recreate the text in a manner that resonates for the audience and elicits truth in whatever form that should take. This point may work in an academic textbook or possibly in particularly un-radical manifesto for the theatre but halfway through watching The Cat’s Mother the central flaw of this approach became apparent. It may be fine for plays where the author is dead or removed from the production but how about when they are very much involved? We are currently in the midst of a startling rebirth of new dramatic writing – a process that seems to come in waves every decade or so. It appears that British playwrights have finally thrown off the shackles of Sarah Kane and Mark Ravenhill and are finding their own voice. Lucy Prebble has followed up ENRON with the acclaimed ‘The Effect’, Simon Stephen’s output has reached prodigious levels and Nick Payne has ‘Constellations’ shortlisted for Evening New Standard Best Play and has enticed Jake Gyllenhall to star in ‘If There Is I Haven’t Found It Yet’ across the pond. Clearly there is a case that the author cannot be ignored if they are alive, kicking and taking an interest in the end product, and this is what I fear may have happened with The Cat’s Mother. Having seen some of the cast earlier in the year in Girlband, I am fully aware of their talents and a transition to more serious subjects was of interest. Pericles Snowdon is an award-winning writer and this meeting of minds was also an enticing prospect. As an audience member you never want to see performers fail. The commonality of purpose and shared experience of theatre means that there is a lot of good will extended towards a production. However this good will is stretched to the limit in a production that suffers from severe tonal shifts which serve to undermine a serious, and potentially tragic, plot. Too often an unnecessary switch to humour falls flat and the play itself is, at times, really quite patronising in its perspective on the dynamics of female friendships. The failure to maintain balance and credible dialogue serves to both regularly break the tension and also visibly undermines the confidence of the cast in the text they have to deliver. Mr Snowdon’s play does not seem to know what it wants to be and there is a lack of coherence in narrative and tone that undermines proceedings from the off. At the heart of this play is a tragic story that uses the fascinating device of Camilo’s Memory Palaces to get to its core. 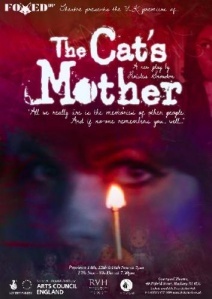 The problem with The Cat’s Mother is that it is not really – at its heart – a play about the concept of memory palaces. They merely serve as the most convenient device to hook Mr Snowdon’s rather threadbare strands together. There is a plot about waking up in a strange room with no memories, a plot about female relationships from childhood, diversions into a world of urban-rural folk tales, a lecture on Camilo and a song. It is unsurprising that the lack of narrative coherence undermines the sterling work done by the cast to breathe life into the script. There are gaping plot holes in the central narrative that makes the audience question the central conceit and whilst plays don’t have to explain they do have to have their own internal logic that can be understood by the audience. Ian Latimer’s set is a masterpiece of working within a budget. He manages to evoke the sense of a palace within the limited surroundings and there are number of innovations that keep the audience engaged. The sound design is also excellent and adds exactly the right note of unease into proceedings. The cast did their best with material that was too often working against their talents and standout among them were Lucy Barnett as Flo and Leanne Ocean as Bea – both of whom managed to smooth out the edges of their character and used the opportunity of their monologues to inject some personality into the roles. Lucy Fazey’s Tabitha is also worthy of note and can enjoy being in the two scenes that formed the highlights of the play – both tellingly set outside the confines of the central plot device. Her opening monologue was well handled and well written and an encounter with a homeless girl gave a startling glimpse of real humour from real characters. There are times that, for whatever reason, a play just does not work. It would be interesting to know whether those involved feel it matched up to initial expectations but it is to be suspected that this is not something that will be stored in one of the rooms of the memory palace.